Imagine a room filled with file folders strewn about with no sense of order or organization. Now, imagine trying to find one specific document amid this mess. Think about how much time it would take, the lost productivity, likely missing of deadlines. 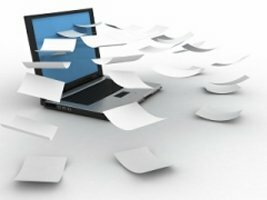 The only solution is to eliminate the mess, get organized, improve your document management workflow, and create order out of chaos. That’s the essence of electronic Document Management. Mission Critical Systems is based in Denver Colorado, but we’ve implemented document management solutions nationwide for a wide range of firms. We approach each project from a consulting perspective– matching one of our 3 solutions to each specific set of requirements and budget. Effective Document Management incorporates the storage, easy finding, protection and retention of documents and other content such as emails. Properly created and deployed, a Document Management system gives authorized users the ability to efficiently find, work on, distribute and protect any substantial document relating to their role in the organization.